Hello Pink When readers! I am Bethany and I blog at Whistle and Ivy. 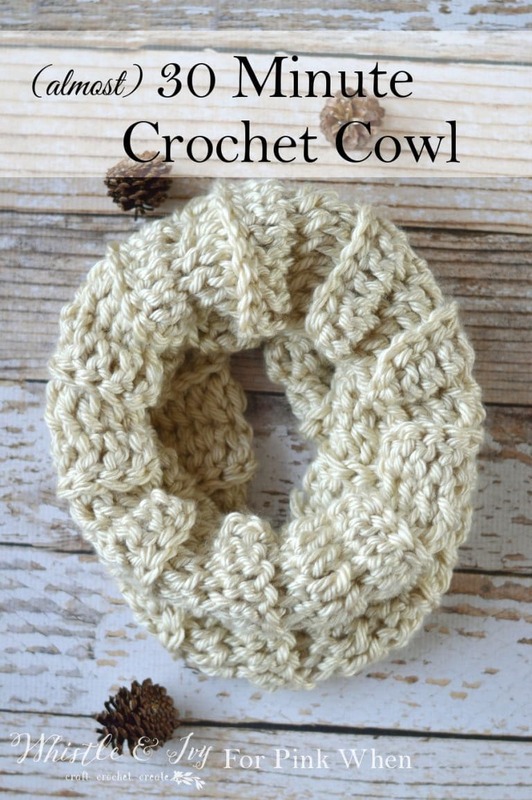 I really wanted to call this the “30 Minute Ribbed Crochet Cowl”, and it almost worked out. It took me a whopping 35 minutes to crochet it, so it was pretty close (I’m being completely honest about the project time-frame here). Despite the extra 5 minutes, this cowl works up pretty darn fast and it’s so comfy to wear. It’s my new favorite go-to gift idea, and I’m pretty sure I need a few more for myself in different colors. This pattern is so simple, you can honestly customize it anyway you would like. 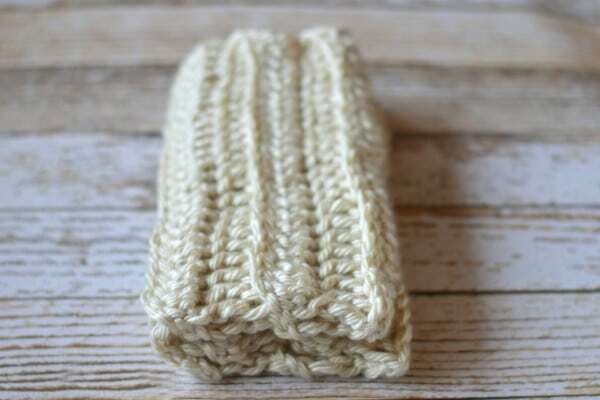 It’s also a perfect beginner project, as it only requires a couple stitches. It’s not quite tall enough to go over your head like a hood, but with a bit of extra yarn (and a few more minutes) and it most certainly could. 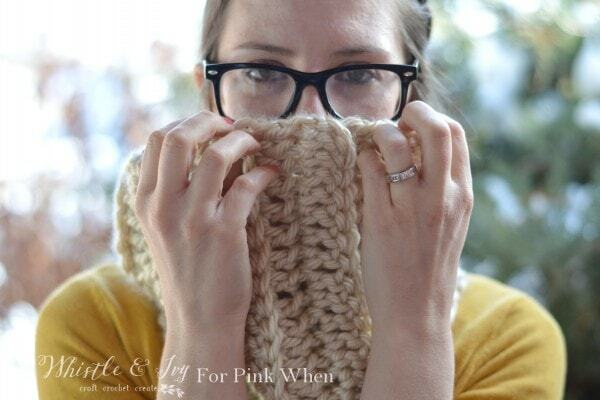 Be sure to begin with more chains, since this cowl is worked beginning with the height, not the width. Literally, that’s it. So quick and simple. From here, fold your cowl in half, with the ribs going vertically. Loosely sl st down the side, sewing the ends together forming a tube. Weave in your ends ( I like to use a smaller hook to do this). If you would like to make it shorter (more snug around your neck), you can work less rows. You can also work more to make it longer. I just swoon over those gorgeous, chunky stitches. Chunky projects have been my favorite lately. 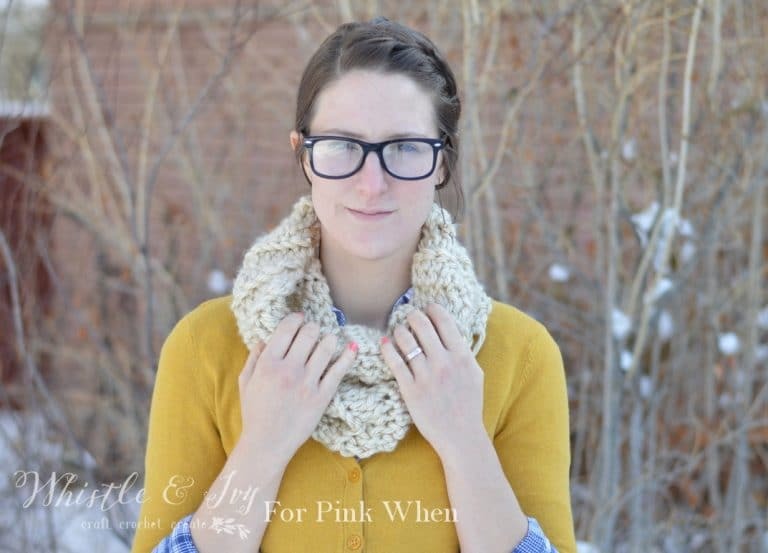 I hope you make this Ribbed Crochet Cowl, I would love to see yours! Share it with me on Facebook or Instagram. And you might like these Crochet Arm Warmers, this Slouchy Hat, Chunky Fringe Scarf, or these Vintage Inspired Arm Wamers. I hope you have a wonderful Holiday this weekend and a Happy beginning to the New Year! what does blo mean in the cowl pattern. In #2 what does -20 mean? How many yards/skiens did you use for your cowl? Made this cowl today. Thank you so much! 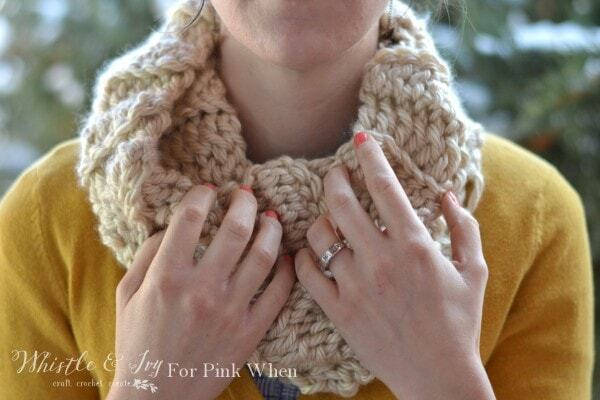 I love the chunky 30 minute cowl. 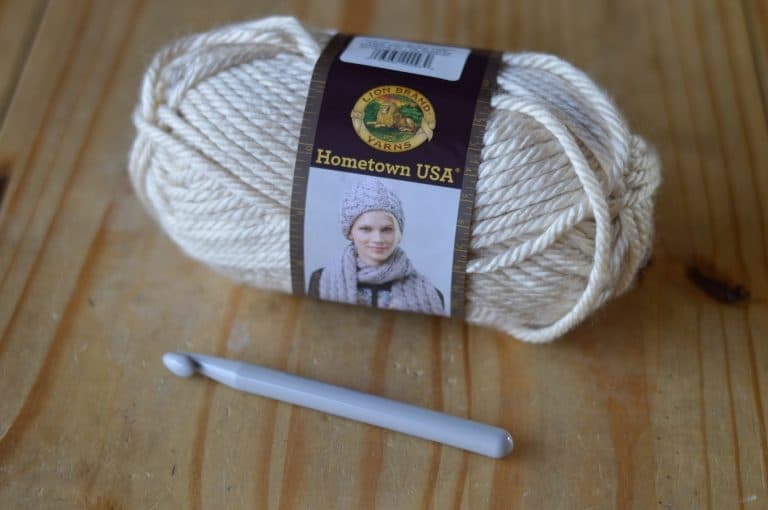 Can you tell me how many skeins/yards and what weight for the project? My cowl turned out great, and I am posting a link to this pattern on my blog CandyComforts.com. Please let me know if you have a problem with that and I will remove the link. Thank you for sharing your pattern.